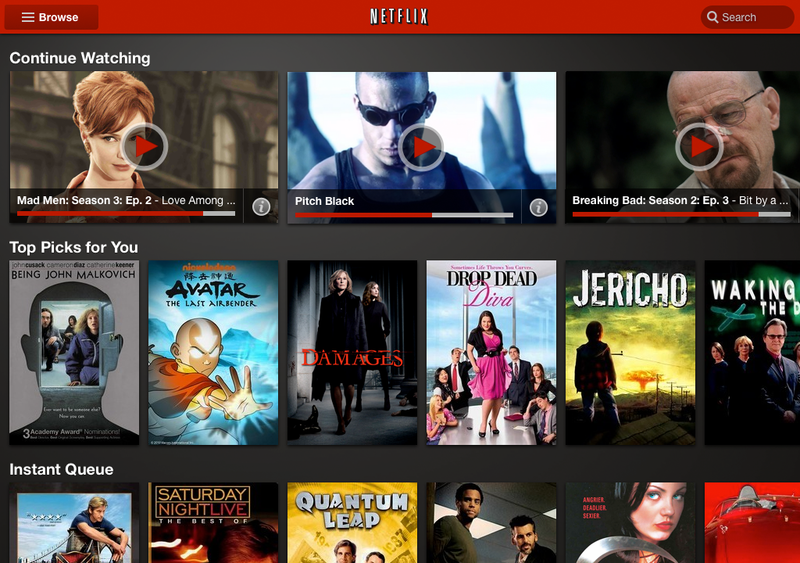 Netflix has been pretty popular among online video watcher as no. of online video watchers continues to increase in the US. Now they have updated their player for Android tablets to give it a more tablet like look and usability. This essentially means better use of the real estate available on the tablets, which includes larger shortcuts and thumbnails for easier navigation, and in general more stuffs at one place in a disciplined way. Doing just that, the new interface displays twice as many movies and TV shows as before, arranged in swipable rows. The recently viewed content is arranged on the top row and has the play buttons for you to quickly play the content you want. Below it you have the top picks according to your taste, and then the instant queue. The top pick and instant queue sections are thumbnails that will take you to that particular page. In the same blog post that he used to inform these updates - Zal Bilimoria said a version optimized for iPad is coming soon that promises the updated UI on Android. Note that Netflix for Kindle Fire and NOOK Tablet will wear similar looks.